The University of Washington Office of Minority Affairs & Diversity (OMA&D) received a new five-year, $4 million grant from the National Science Foundation to continue a highly successful program that prepares underrepresented minority students for careers in STEM fields. Like the previous grant, the UW serves as the lead institution for an alliance comprised of five regional universities (Boise State University, Oregon State University, Portland State University, UW, Washington State University) and five two-year colleges (College of Western Idaho, Linn-Benton College, Portland Community College, Seattle Central College and Yakima Valley College). The goals of the alliance are focused on increasing the number of underrepresented minority (URM) students who enroll in STEM majors and receive STEM bachelor’s degrees. Since the alliance was formed, URM student enrollment in STEM majors at these universities has nearly tripled and the number of bachelor’s degrees awarded is just over triple the number awarded in 2009-10. At the UW, the number of STEM degrees awarded to URM students supported by LSAMP has also tripled. 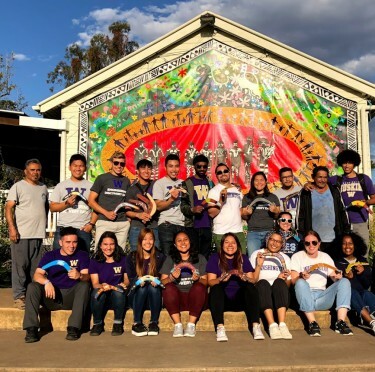 In addition, the UW’s program has produced five UNCF/MERCK undergraduate science research scholarship recipients and one Fulbright Scholar, as well as supported five study abroad cohorts to Australia in partnership with the UW College of Engineering. “We are excited that the NSF is making the commitment to continue focusing on the inclusion of diverse students in STEM pathways and graduate education, efforts that will certainly strengthen our nation’s scientific and academic workforce,” said UW Provost Mark Richards, PNW LSAMP principal investigator. The program helps broaden STEM participation by integrating academic and social supports that build community amongst URM students. Through their participation, students have access to undergraduate research and internship opportunities, tutoring and instructional support, and funding for travel to professional conferences. UW LSAMP also has a close partnership with the Washington NASA Space Grant Consortium through which students are connected to scholarships and research placements. The new grant will add programming elements that focus on leadership and mentorship, including opportunities to participate in program operations and gain access to faculty mentors. It will also include action-oriented research by a team in the Center for Evaluation & Research for STEM Equity on the experience of LSAMP students that will contribute to a more nuanced understanding of the persistence among URM students in STEM. “Together with student programming and educational research conducted by PNW LSAMP, the alliance hopes to develop a better understanding of how programs such as this foster a sense of belonging for students from diverse groups, and provide insights as to how the unique assets of these students are valued within their educational context,” said Gabriel Gallardo, OMA&D associate vice president and PNW LSAMP program manager. In addition to Provost Richards, serving as co-principal investigators of the grant are Susan Jeffords (Portland State), Daniel Bernardo (WSU), Donna Llewellyn (Boise State) and Jesse Y. Nelson (Oregon State). Established in 1968, the University of Washington Office of Minority Affairs & Diversity (OMA&D) broadens college access and supports the academic success of underrepresented minority, first-generation and economically disadvantaged students, as well as cultivates a campus climate the enriches the educational experience for all. OMA&D college access programs serve over 25,000 students in K-12 school districts and two-year colleges across the state of Washington and its student success programs serve over 6,000 UW undergraduates.